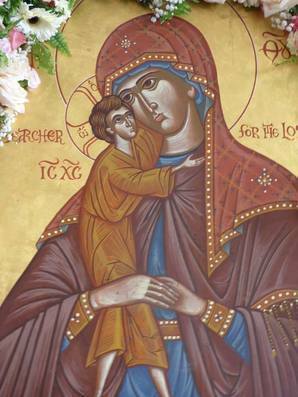 The Patron of Holy Resurrection Monastery is the Theotokos, Searcher for the Lost. There are many variations of this title for Our Lady, such as, Seeker of the Lost, Searcher of the Lost, Seeker of the Perishing and more. “Seeker of the Perishing” Icon of the Mother of God From time immemorial the Russian people, with faith in the all-powerful help of the Most Holy Theotokos, considered the title “Seeker of the Perishing” to refer not only to those who are dying, but to those whose souls are in danger of spiritual death. There are no reliable accounts of the origin of the icon, “Seeker of the Perishing.” There are, however, several wonderworking icons of this name, through which the Theotokos showed forth Her mercy to people on the very brink of death. In the mid-eighteenth century, in the village of Bor of Kaluga governance, the pious peasant Thedotus Obukhov lost his way in a blizzard on the Feast of the Lord’s Baptism. The horse became exhausted and paused on the edge of an impassable ravine. Not seeing any way to save himself, Obukhov lay down in his sleigh, where he began to freeze. In these terrible moments he prayed with all his being to the Queen of Heaven for help, and he vowed that if he was rescued he would have a “Seeker of the Perishing” icon painted and donate it to the local church. She heard his prayer and helped him in a marvelous way. A certain peasant in the nearby village heard a voice outside his window saying, “Take him.” He went out and saw the half-frozen Obukhov on his sleigh. When he recovered his health, Obukhov immediately fulfilled his vow and commissioned a copy of the icon from the St George church in the city of Bolkhov in the Orlov governance. From that time the Bor “Seeker of the Perishing” Icon was glorified by many manifestations of grace and miracles. There are other “Seeker of the Perishing” Icons: one manifested itself in 1770 in the village of Malizhino in Kharkov governance, and delivered the people from cholera three times; there was another in the village of Krasnoe in Chernigov governance, and another from Voronezh and Kozlov in Tambov governance. In the year 1835, at the Moscow Alexandrov Orphanage Institute, a church was consecrated in honor of the “Seeker of the Perishing” Icon. Of particular interest is the “Seeker of the Perishing” Icon in the Church of the Glorious Resurrection in Moscow. This icon had been transferred from the church of the Nativity of Christ to the Palashevska alley. Its final owner had become widowed and was on the verge of complete poverty. Fervent prayer to the Most Holy Theotokos saved him from despair and arranged matters for his daughters. This man felt that he was not worthy to have this wonderworking icon in his house, so he gave it to the church. In 1812 the Palashevsk church was pillaged by the French. The desecrated icon was found broken into three pieces among the rubble. With the finding of the icon, numerous miracles of healing took place. Brides entering into marriage pray before this icon that their marriage might be a happy one. People come to it, overwhelmed by drunkenness, perishing in poverty, suffering in illness, and they turn to the Icon in prayer as to a Mother with Her perishing children. The Queen of Heaven sends down help and support for all: “Seek us who are perishing, O Most Holy Virgin, chasten us not according to our sins, but as you are merciful in your love for mankind, have pity, deliver us from hell, sickness and necessity, and save us” (Troparion, Tone 4).